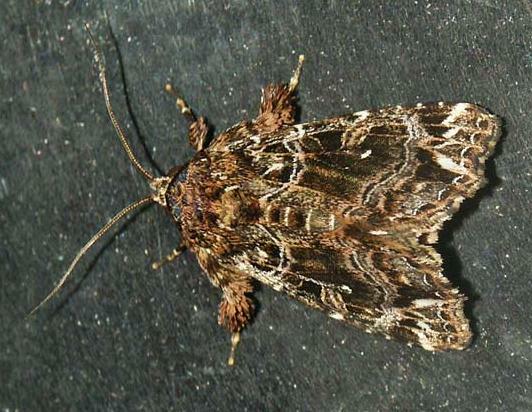 The adult moth of this species is a brown with some white markings on each forewing, including a prominent white patch which protrudes halfway along each forewing margin. The hindwings are pale brown. Underneath, the wings are a uniform brown except for the white patch on each forewing margin, and a couple of indistict wiggly submarginal lines on each hindwing. The wingspan is about 2 cms. Part 12 (1858), p. 867, No. 15.